Atmocean is currently working along two tracts; 1.) Final field trials of its near shore Wave Rider pump, set to take place in both spring and fall of 2018 at the College of North Atlantic in Newfoundland and 2.) Continuing with Sandia National labs feasibility studies of OSCAR (Ocean Surface CArbon Relocation), aimed at providing a carbon sequestration solution through the use of wave energy. 1.) After finalizing its wave energy converter with five successful wave tank trials in 2016 and the beginning of 2017 at TEXAS A&M, Atmocean was able to further simplify operations, lower component costs, and improve system durability. Atmocean conducted a full scale test in Newfoundland at Lord’s Cove during the month of September/October and identified further gains to ease deployment and recovery operations as well as ways to improve pressure output for each pump over a fixed timeline. With two Sandia National Lab studies concluding in Dec. 2017, Atmocean will be able to cycle real world testing results through Sandia’s models enabling optimization of upcoming tests. In 2015, Atmocean was able to deploy two full size component systems off the southern coast of Peru. These tests accomplished and proved out the use of standard shipping methods, quick build out time with local labor, deployment using small boat operations, recovery, and functionality under winter storm conditions in which our system experienced wave heights over 4m. 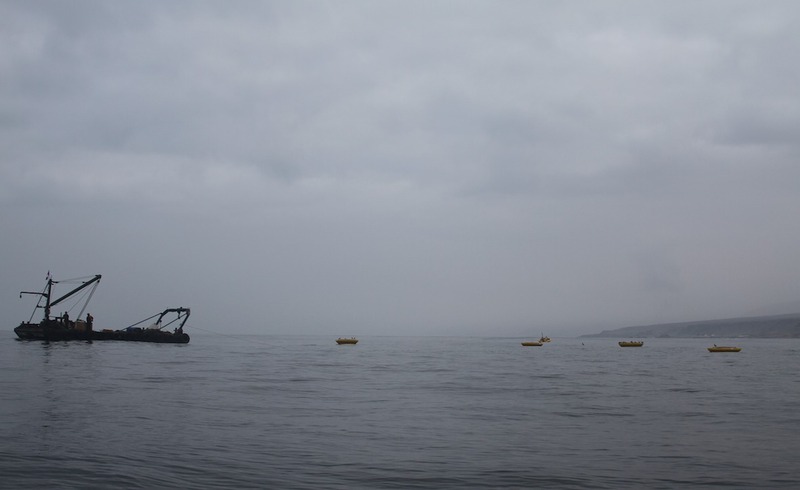 These demonstrations have allowed Atmocean to showcase its wave energy technology to local stakeholders in municipal water, agriculture, and mining, with increased interest noted both in Peru and Chile. We continue to work with partners in this region towards the realization of commercial systems. The west coast of Latin America is an ideal location for this first Atmocean project due to the steady waves which originate in the Antarctic and are carried towards South America’s western coast. With less seasonal variability, efficiency is higher and costs are lower. With the exceptionally dry coastal climate, forecast population growth, and shrinking of mid altitude glaciers at the headwaters of the Andes, the entire region is experiencing water shortages that are set to become more severe. Atmocean aims to be a sustainable water solution for this region. The business climate in Latin America continues to improve, with many economies maintaining robust growth at ~5% per year with low inflation. The need for new sources of water and energy are accelerating. Atmocean began business in 2006 and has to date conducted 30 sea trials, been awarded nine grants from Sandia National Laboratories, the Oregon Wave Energy Trust, and UK’s Technology Strategy Board. Additionally, Atmocean has performed eight trials at wave tank testing facilities in both the University of Plymouth (UK) and TEXAS A&M. Atmocean received a grant from Los Alamos National Labs in 2016 to model the level of carbon sequestration that is feasible from bringing fresh water onshore in desert regions to grow produce. We call this potential game changer, “greening the deserts.” In addition to becoming a new sustainable agriculture solution, Atmocean is working with stakeholders in sustainable land based aquaculture. With over half of all seafood consumed originating from aquaculture, Atmocean aims to provide pressurized seawater to numerous land based aquaculture farms, further moving this practice towards clean energy independence. 2.) Atmocean has begun to investigate using wave energy to enable carbon sequestration. OSCAR or “Ocean Surface Carbon Relocation” technology uses wave energy and salinity-gradients to pump surface ocean water containing higher levels of dissolved organic carbon to below 1,000 meter depth, thereby sequestering the carbon for decades to centuries. Atmocean first focused on this concept from 2006-2009, but following the failure of the 2009 UN COP-15 Summit in Copenhagen to implement a global price on carbon, the company pivoted towards pumping seawater towards shore as input into reverse-osmosis desalination systems. Since that time, CO2 emissions have continued to accumulate in the environment, amplifying global climate change and reviving interest in Atmocean’s legacy technologies. Accordingly, Atmocean recently completed a study with Sandia National Laboratories to review the idea of using seawater downwelling pumps to deliver surface water into the deeper ocean. Initial findings justify further evaluation and testing of this new approach to sequestering CO2.